* Bait-Tech Viaduct, Somerton, Somerset. Silverfish pairs. Sat, 36. Campbell, Cary and Spring lakes. Andy Power (Preston Innovations Thatchers) 32-1-0, five decent skimmers on tip then skimmers on long pole with caster over groundbait, peg 19 Spring; Nicky Collier (GOT Baits) 24-11-0; Andy Crocker (Frenzee West Wales) 23-5-0; Mark Harper (Preston Innovations Thatchers) 19-0-0. Sun, 36. Lee Edwards (Daiwa Dorking) 24-12-0, skimmers on long pole and caster over groundbait, peg 10 Spring; Matt Parsons (Preston Innovations Thatchers) 19-0-0; Paul Greenwood (Bait-Tech Viaduct) 14-9-0; Dave Roper (Reids Tackle) 12-14-0. Pairs: Nicky Collier and Matt Tomes 9 (54-4-0); Mark Harper and Des Shipp 9 (47-5-0). * Bathampton AA Xmas, Bristol Avon and Kennet and Avon Canal. Sun (Dec 15), 36. 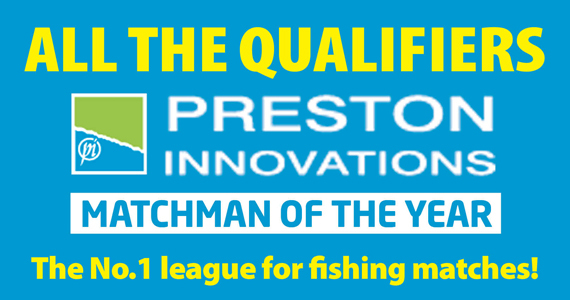 Tim ‘Clucker’ Ford (Preston Innovations Thatchers) 24-9-0, bream on groundbait feeder with worm and maggot; Lewis Walker (Bristol Angling Centre) 22-4-0; Shaun Townsend (Maver Bathampton) 19-3-0; Derek Jarman (Maver Lobby’s) 17-9-0; Jerry Pocock (Amalgamation) 14-10-0. * Gold Valley, Ash, Hants. Sat, 31, Gold, Middle & Bungalow lakes. Mark Goddard (Daiwa Dorking) 54-8-0, carp, bomb and corn; Ian Harper (Kent) 46-4-0; Steve Sanders (Preston Innovations) 44-4-0; Paul Hiller (Daiwa Dorking) 41-0-0;Perry Stone (Yorkshire Bait Company) 27-8-0; Marcus Page (Springlakes CC) 25-0-0. * Maldon, Chelmer Navigation, Heybridge, Essex. Sun, 31. 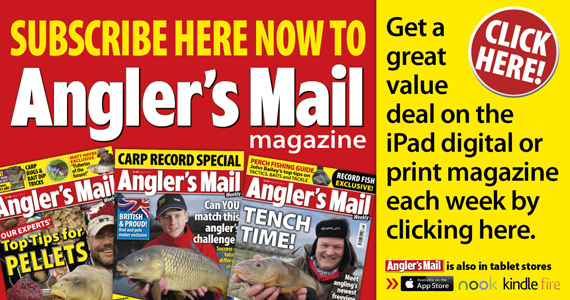 Simon Colclough (Browning/Maver Image) 5-4-0, two 10 oz perch, rest roach on punch then bloodworm, first peg above Tesco’s footbridge; Danny Mason (Bill’s Tackle) 3-9-0; Geoff Foreman (Matchpack) 3-1-0; Mark Campion (Maldon) 2-11-0; Gavin Askew (Does) 2-3-0; Mick Burrell (Matchpack) 2-2-0. * Ockendon Bait & Tackle, Puddledock Farm, Upminster, Essex. Sun, 53. Kevin Attreed (Bowlers) 171-5-0, 40 carp to 8 lb, bread across and down track peg 11; Ian Nash (Ockendon Bait & Tackle) 150-1-0; Rob Bishop (MAP Ockendon) 60-4-0; Jimmy Collins (Ockendon Bait & Tackle) 58-6-0; Steve Banks (Ockendon Bait & Tackle) 52-2-0; Steve James (Ockendon Bait & Tackle) 49-10-0. * Reading DAA, Kennet and Avon Canal, Froxfield, Berks. Sun, 36.Mick Palk (Thames Valley Angling) 10-9-0, perch, poled chopped worms; Martin Kirk (Sensas A4) 9-8-0; John Williams (Sensas A4) 8-3-8; Lionel Cook (Thatcham Angling ) 8-2-0; Arnold Liaukevicius (Tubertini) 8-0-0; Dave Stratford-Way (Tubertini ) 6-12-0. * Shiplate Farm Xmas, Weston Super Mare. Sun (Dec 22), 37. Phil Harding (Avon Angling) 50-9-0, carp on poled pellet, peg 15 Main lake; Dom Sullivan (Maver Cadbury Angling) 34-5-0; Matt Tainton (Shiplate) 23-10-0; Lewis Jones (Sensas Thyers) 21-6-0. Silvers: Julian Pinkett (Bristol PO) 16-10-0. * Slough House Lake, near Upminster, Essex. Sun, 41. Adam Southgate (Garbolino Black Horse) 28-10-0, skimmers, long poled expander pellet, peg 7; Jim Wilson (Ockendon Bait & Tackle) 23-0-0; Pete Vasey (Oakwood Angling) 18-6-0; Andy Griffiths (Image) 17-0-0; Mick Hood (Bowlers) 16-4-0; John Hunt (Brentwood Angling) 15-4-0. Sun (Dec.22), 34. Mick Wallis (Ockendon Bait & Tackle) 20-14-0, skimmers, long poled expander pellet, peg 4; John Southgate (Garbolino Black Horse) 18-8-0; Jim Wilson (Ockendon Bait & Tackle) 17-12-0; Mick Hood (Bowlers) 17-8-0; Steve O’Rourke (Nash) 17-6-0; Dave Whitman (Oakwood Angling) 16-0-0. Bait-Tech Viaduct, Somerton, Somerset. Costcutter. Thurs, 20. Campbell and Cary. Steve Tucker (Garbolino) 96-4-0, carp on waggler and maggot, peg 123 Campbell; Ben Bentley (Vespe Army) 60-6-0; Colin Dyer (Langport AA) 52-14-0; Steve Denmead (Keyford) 42-11-0; Mark Vigar (Langport) 38-12-0; Trev Heathman 32-5-0. Silvers: Phil Harding (Avon Angling) 13-1-0. Colemans Cottage, Witham, Essex. Tues, 20. Rav Pisana (Galleywood) 102-0-0, carp to 4 lb, pellet, 8m ,Wood Lake peg 26; Steve James (Ockendon Bait & Tackle) 71-8-0; Frank Thomas (Browning Wickford) 71-0-0; Pat Cooper (Cariers) 66-8-0. Boxing Day, 16. Gavin Bridge (Cariers) 59-0-0, pellet at 15m to island, Pathfield peg 4; Rav Pisano (Galleywood) 50-0-0; Nick Darke (GOT Baits) 45-8-0; Josh Blavins (Colemans) 43-8-0. Sat, 15. Wayne Candy (Browning Wickford) 64-0-0, F1s, pellet in margins ,Wood peg 9; Rav Pisano (Galleywood) 56-8-0; Nick Darke (GOT Baits) 56-0-0. Sun, 21. Jeff Church (Colemans Bait & Tackle) 91-0-0, pellet, 16m, Pathfield peg 36; Jim Trew (Colemans Bait & Tackle) 72-8-0; Kurt Choppin (Cariers) 62-0-0; Gary Upjohn (Cariers) 42-0-0; Terry Edwards (Browning Wickford) 38-4-0; Paul Chambers (Colemans Bait & Tackle) 38-0-0. Gold Valley, Ash, Hants. Wed, 25, Gold Lake. Sean Barnet (Drennan Bordon) 13-8-0, carp and silvers, poled maggots; Gary Thomas (Springlakes CC) 9-10-0; Jeb Attwood (Gold Valley) 8-9-0; Roger Beale (Springlakes CC) 4-6-0. Sun, 28, Gold Lake. 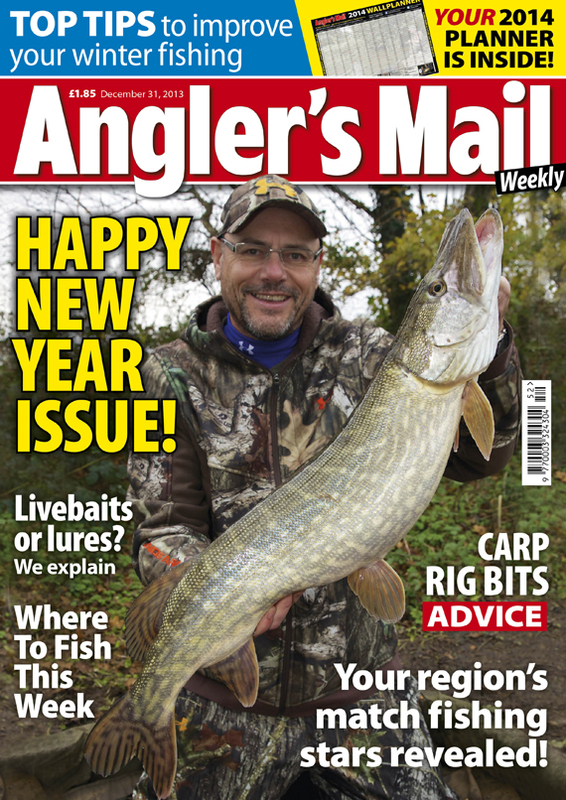 Malcolm Bond (Pimlico Plumbers) 22-2-0, carp and bream, poled corn; Charlie Dalton (Springlakes CC) 15-10-0; Roger Beale (Old Boys) 12-0-0; Stefan Gent (Springlakes CC) 11-12-0; Jeb Attwood (Springlakes CC) 7-4-0; Simon Bowerman (Sensas A4) 7-2-0. Gwinear, Newquay, Cornwall. Sun, 12. Harry Billing (Garbolino) 47-12-0, carp on feeder and pellet and pole and pellet, peg 4 Phase 1; Chas Ward (Gwinear) 38-8-0; Roy Booth (Barns) 32-12-0; Andy Patterson (Gwinear) 20-1-0; Roger Baker (Sensas Thyers) 16-10-0. Iden Wood Fishery, nr Rye, East Sussex. Sun, 12, Match Lake. Matt Parsons (Iden Wood) 39-12-0, two carp including one of 20 lb plus silvers, pole and maggot, peg 30; Neville James (Iden Wood) 15-10-0; Chris Pope (Tenterden AC) 12-13-8; Jamie Ford (Iden Wood) 9-11-0; Andy Ashdown (Iden Wood) 9-5-0. Ockendon Bait & Tackle, Puddledock, Essex. Fri, 44. Ross Harold (Ockendon Bait & Tackle) 162-6-0, 40 carp to 8 lb, maggot, Snake peg 11; Ken Ogbourne (Ockendon Bait & Tackle) 72-2-0; Keith Miles (Ockendon Bait & Tackle) 67-8-0; Albert Bowers (Ockendon Bait & Tackle) 44-0-0; Steve Mould (Ockendon Bait & Tackle) 35-12-0; Steve James (Ockendon Bait & Tackle) 33-8-0. Shiplate Farm, Weston Super Mare. Sun, 15. Matt Tainton (Shiplate) 80-12-0, carp on poled pellet, peg 15 Main lake; Steve Howell (Shiplate) 30-12-0; Julian Pinkett (Bristol PO) 9-1-0; Alan Healey (Frys MG) 8-15-0. Silvers: Julian Pinkett 9-1-0. Sonubaits Passies, Lancing, West Sussex, Match Lake, 15. Jason Kirk (Match Arun) 75-13-0, small carp and F1’s, pole and pallet, peg 35; Tony Parnall (Sonubaits Passies) 43-9-0; Steve Peacock (Fox Match Arun) 33-4-0; Ollie Tilley (Fox Match Arun) 31-8-0. Threemilestone. Nr Truro, Cornwall. Sun, 8. Chris Bailey (TMS) 11-10-0, roach, skimmers and chub on pole and maggot over groundbait; John Shirley (White Acres) 8-10-0; Stuart Lister (Spro) 5-12-0. Todber Manor, Dorset. Sun, 24. Phil Harding (Avon Angling) 98-7-0, carp on long pole with maggot over micros, peg 37; Steve Nadin (Maver Cadbury) 94-2-0; Tony Rixon (Mosella Avon Angling) 81-5-0; Nick Merry (MFS) 80-10-0; Mike Nicholls (Silverfox) 74-15-0; Fred Roberts (Maver Veals) 69-13-0. Tylers Common, Brentwood, Essex. Sat, 28. Richard Wager (Bowlers) 85-4-0, carp to 8 lb, poled pellet & feeder with dead maggot, Horseshoe peg 32; Zac Lori (Ipswich) 52-8-0; Peter Beck (Ockendon Bait & Tackle) 48-6-0; Gary Ford (Ockendon Bait & Tackle) 39-4-0; Steve Copping (Ockendon Bait & Tackle) 39-0-0; Jamie McQuire (Rib Valley Angling) 27-12-0. Willow Park, Ash, Hants. Sun, 5, small lake. Doug Graves (Willow Park) 32-8-0, carp, wagglered pellets. Wylands, Battle, East Sussex. Sun, 16, Old Snake Lake. Ian Oliver (Wylands) 39-12-0, all carp, pole with maggot and bread, peg 17; Richard Lovewell 26-8-0; Henry Ecclestone 17-8-0; Steve Grounds and Anthony Page both 12-7-0; Tony Guillan 10-6-0 (all Wylands).